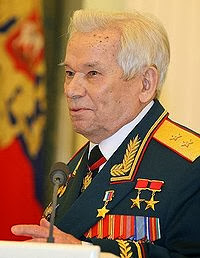 Mikhail Kalashnikov, the creator of the famous AK-47 assault rifle, has died at the age of 94, according to Russia Today. He had reportedly been suffering from heart problems and was in intensive care since November. The Kalashnikov AK-47 is frequently cited as the world's most popular assault rifle, with its only serious rival being the American M-series rifle. Still, Kalashnikov had mixed feelings about his success. "I would prefer to have invented a machine that people could use and that would help farmers with their work — for example a lawnmower," he said on a visit to Germany in 2002. Kalashnikov was a self-taught peasant turned tank mechanic who never finished high school, RT writes, and he only became a weapon designer after he was shot in the shoulder in World War II. The AK-47 was introduced in 1948 and became one of the first assault rifles of the 2nd generation. Its remarkable success come from a variety of factors, including durability and low production cost — they reportedly sold in war-torn countries for as little as $15. However, their popularity amongst criminals and terrorists led to some concern for the inventor. "It is painful for me to see when criminal elements of all kinds fire from my weapon," he explained again in 2009, on his 90th birthday. In hindsight, too, many would have regretted another decision. The original design for the AK-47 was never patented, and Kalashnikov reportedly never saw any of the profits from his invention — a few years ago it was estimated that half the AK-47s in the world were actually counterfeits. Still, the inventor never seemed to mind.